Property lots and landscaping are often huge draws to home buyers and those who want to begin the process of building a home. Huge oak trees, decorative Japanese maples, blooming cherry trees, and the magnificent dogwoods are well known throughout Georgia as trees that bring great beauty to any landscape. However, whether you are buying an older home nestled among 100-year-old oaks or building a new home and installing your own landscaping, trees should be taken into consideration regarding the integrity of your home’s foundation. When planting trees near a home, there are benefits that trees bring to your property. Trees provide soil stabilization by helping to prevent erosion, especially on sloped areas of a property. Trees also help to control water drainage because they soak up extra moisture. These are two benefits of trees being planted within a relatively close distance of your home or on your property, however the placement of these trees is incredibly important due to the extensive damage that they can cause. While trees are an incredibly beautiful part of nature, trees typically have vast root systems that spread out two to three times farther than the above-ground branch. That means that your beautiful flowering cherry tree that you decided to plant outside your dining room window will have branches that are approximately 15-feet wide, and the roots of the tree can spread 30 to 40 feet in diameter. This is the exact factor that many homeowners do not take into consideration. With the spreading of tree roots, the smaller roots commonly eat into the concrete walls of a home’s foundation. It is truly incredible how strong and tenacious tree roots are, but if you have ever unearthed roots from even a small bush then you know how vast root systems can be. Roots that go unchecked and that eat into a home’s foundation will compromise the entire home. The foundation’s integrity will be vulnerable to becoming weaker with each passing year. Root expansion also causes uneven soil shifting around a home, and this can lead to dire consequences. Issues from soil expansion can lead to excessive water absorption under and around a home, causing the foundation to crack under pressure. Trees are notorious for soaking up every bit of water from the ground, causing their roots to expand and thicken. When this expansion and growth occurs right at your home’s foundation, the integrity of your home is at stake. 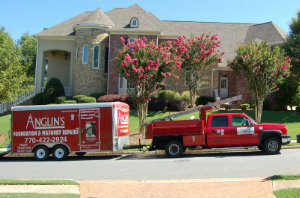 Anglin’s Foundation & Masonry Repairs is the name to trust at the first sign of damage or compromise to your home’s foundation. Trees are lovely, but they do not always add value to a home – sometimes they negate value. Call us today for periodic inspections to check the health of your home’s foundation.